Privately-owned housing starts in November were at a seasonally adjusted annual rate of 685,000. This is 9.3 percent (±13 1%)* above the revised October estimate of 627,000 and is 24.3 percent (±20.1%) above the November 2010 rate of 551,000. Single-family housing starts in November were at a rate of 447,000; this is 2.3 percent (±8.0%)* above the revised October figure of 437,000. 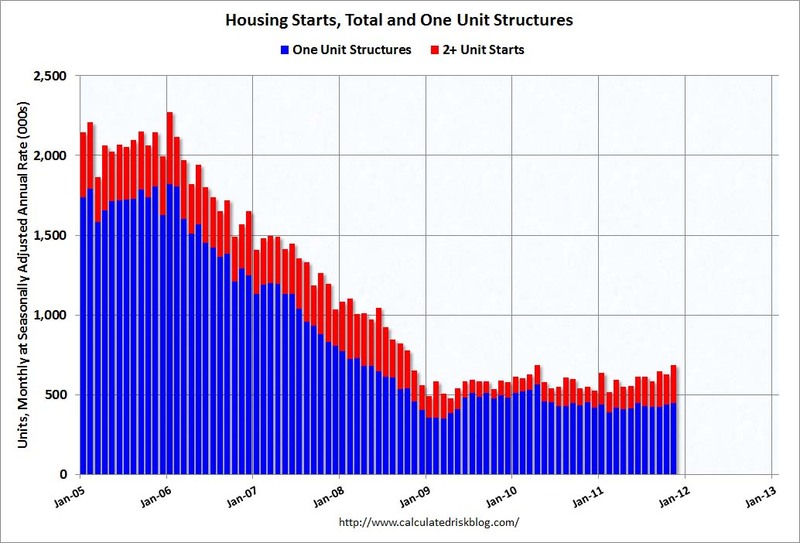 The November rate for units in buildings with five units or more was 230,000. Privately-owned housing units authorized by building permits in November were at a seasonally adjusted annual rate of 681,000. This is 5.7 percent (±1.6%) above the revised October rate of 644,000 and is 20.7 percent (±1.8%) above the November 2010 estimate of 564,000. Single-family authorizations in November were at a rate of 435,000; this is 1.6 percent (±1.6%) above the revised October figure of 428,000. Authorizations of units in buildings with five units or more were at a rate of 224,000 in November. Total housing starts were at 685 thousand (SAAR) in November, up 9.3% from the revised October rate of 627 thousand (SAAR). Most of the increase this year has been for multi-family starts, but single family starts are increasing a little recently too. Single-family starts increased 2.3% to 447 thousand in November. 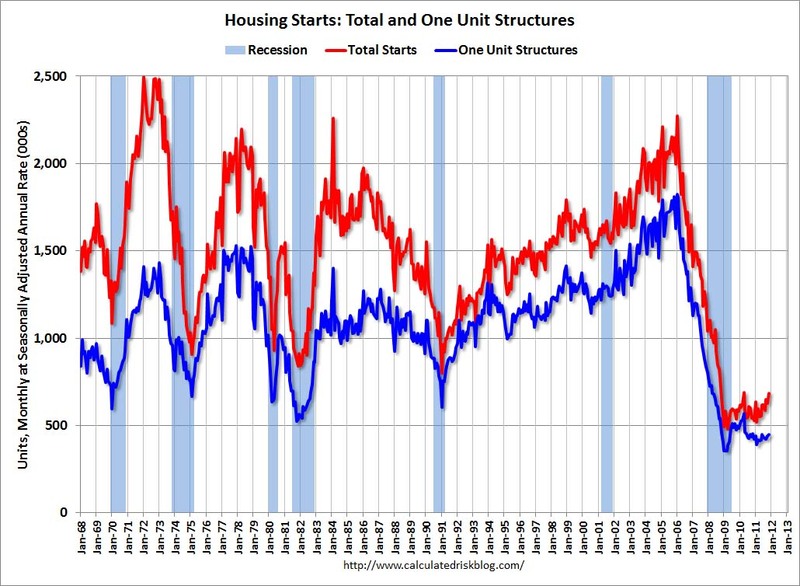 This shows the huge collapse following the housing bubble, and that housing starts have been mostly moving sideways for about two years and a half years - with slight ups and downs due to the home buyer tax credit. Multi-family starts are increasing in 2011 - although from a very low level. This was well above expectations of 630 thousand starts in November. 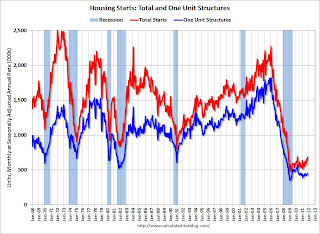 Single family starts are still mostly "moving sideways".